WPBeginner» Blog» Beginners Guide» How are WordPress.com and WordPress.org Related? At WPBeginner, one of the most commonly asked question by our users is whether they should use self hosted WordPress or get a Free WordPress.com blog. We have covered this topic in detail and have discussed pros and cons of both options. However it seems that we usually get a follow up question along the line of how are WordPress.com and WordPress.org related? Which one is the official WordPress that everyone is talking about? What is this WordPress foundation? If you ever had these questions, then you are in the right place. In this article, we will explain what is the relationship between self-hosted WordPress (aka WordPress.org) and WordPress.com. Hopefully this will clear any confusion that users have in mind. What is Self-Hosted WordPress (WordPress.org)? WordPress.org is home to the most popular Content Management System (CMS), WordPress. Founded by Matt Mullenweg and Mike Little in 2003, WordPress was initially a fork of another blogging software called b2 cafelog. WordPress was started as a blogging platform however it has evolved into a powerful publishing platform that goes far beyond simple blogging. WordPress is an open source software which means any one can contribute to it, use it, copy it, build upon it and redistribute it without any restrictions. Over the years WordPress grew, became popular, and today it is the most commonly used publishing platform to build websites throughout the world. When you hear folks talking about WordPress at conferences, meetup groups, blogs, youtube videos, and other places, then they are most likely talking about the self-hosted WordPress. If you are thinking about creating a website or blog for your company, and you want to use all the cool plugins that you hear about, then you need to use the self-hosted WordPress. Plugins are NOT allowed on WordPress.com. Self-hosted WordPress is free for everyone to use in any way they like. Read: Why is WordPress free? What are the costs? What is the catch? WordPress.com is a proprietary blog hosting solution with limitations. Despite the same name, WordPress.com and WordPress.org are NOT directly related. WordPress.com does use the open-source WordPress platform at its core to power all the blogs they host, but they have restrictions such as you cannot upload plugins, custom themes, etc until you pay high premiums. Many users use WordPress.com to get started, and then migrate over when they realize they want more features, functionality and control. Here is a guide on how to move your blog from WordPress.com to self hosted WordPress.org. WordPress.com is owned by a company called Automattic which was founded by Matt Mullenweg (co-founder of WordPress). They are NOT related. 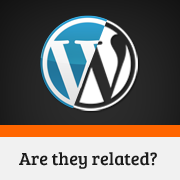 The reason why people confuse the two together is because they both have the name WordPress, which is actually a registered trademark owned by the WordPress Foundation. Another reason for the confusion is that Matt Mullenweg (co-founder of WordPress) is the founder of Automattic which owns the blog hosting service, WordPress.com. Lastly, a lot of the Automattic employees are regular contributors of WordPress.org. Despite these common grounds, the two projects are totally different entities. WordPress.org (aka self-hosted WordPress) is home to the highly extensible and powerful content management system. On the other, hand WordPress.com is a service built upon the open source WordPress at its core. WordPress.com does not offer you the freedom to modify your source code, or upload your own plugins, or extend the features. Update March 26, 2013: If you use Jetpack plugin, or WordPress.com Stats plugin, then you are required to connect your self-hosted WordPress site to WordPress.com in order to use their services. By doing this, you do end up giving WordPress.com access to some of your data such as stats (if you are using the stats plugin). What is this WordPress Foundation? It is important that we mention that WordPress foundation is registered by Matt Mullenweg (co-founder of WordPress). The current person in charge of dealing with WordCamps and other WordPress foundation duties is an Automattic employee. For one, people often associate .com sites to be official. Whereas in this case, WordPress.org is the official WordPress platform. 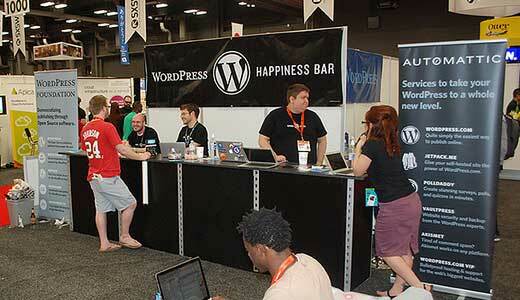 Another reason for confusion is when you attend conferences like Blogworld or SXSW, then you notice one WordPress booth that has Automattic on one side, and WordPress foundation on the other. Having a booth like that make users think that Automattic, WordPress, and WordPress foundation are all connected entities. This causes a lot of confusion for new users. We always recommend our users to use WordPress.org aka self-hosted WordPress. It is very easy to install WordPress, and you have full control over your site. You can add plugins, custom themes, monetize your site, create your own membership site, and/or use one of our WordPress tutorials to extend the functionality without any restrictions. Since there are so many other people familiar with WordPress, it is very easy to get WordPress support granted that you ask the right questions. Read our guide on how to properly ask for WordPress support. We hope that this article helped you understand the relationship between WordPress.org and WordPress.com, and cleared all confusions. If you have something to add or thoughts on this topic, then we encourage you to comment below. This was a very helpful article. I have a blog site with wordpress.com and I am looking to migrate to wordpress.org. I would like to know if I have to pay the registration of my domain and the Premium Plan that I have at wordpress.com. May I switch the domain? You will have to pay for the WordPress hosting. Once you have moved your website, you will change the domain name settings and point them to your new hosting provider. You can choose to keep your domain name at WordPress.com and manage it from there. I was looking into the collaboration of Automattic and wordpress.org to see if Automattic has power over it. I noticed that over at the WordPress.org site, their theme review team seems to have been taken over by an Automattic employee named Tammie Lister and was wondering how that can happen if the two are separate. Regardless if it’s Tammie or another from Automattic, do they have say as to what happens at .org ? While in theory Automattic as a company doesn’t have any power over WordPress.org, the CEO and founder of Automattic is Matt Mullenweg who’s also the chairman of the WordPress foundation (which handles everything related to WordPress.org). I will let you come to your own conclusion there. Out of the 6 Active Admins, only 1 is an Automattic Employee (Tammie Lister). Also if you look at the Make WordPress page for Themes, you will see that no one person has taken over and other admins like Chip, Emil, etc are just as active. Thank you for this excellent explanation. I thought self hosting would be much more complex and now I see that it’s not the right way to go. I do have a lot to learn though before I can contemplate creating my site. Nice post, very useful for newbies! I still have one question. I started one blog through WP.com and moved it to self-hosted. Another blog was begun self-hosted. Yet every year, I get an email from WP with my annual stats. I access it for one blog using the original WP.com sign in. But how do I get the annual stats for the site that has always been self-hosted? If the two WPs have nothing to do with each other, I wouldn’t expect to get a stats email for the always self-hosted blog. If you are using WordPress.com Stats or Jetpack plugin, then you connect your site with WordPress.com (thus giving them access to your data). This is how they can send you those annual stats email. I’m often asked why a self-hosted WordPress.org website. I now have a thorough explanation for them. There is also a lot of confusion when you mention WP because people think “blog.” And many organizations still do link their non-WP site to a WP blog (a blog is simply an article, another point of confusion). However, as you mention in your post, WordPress.org IS a content management system that functions as a website. It’s difficult for newcomers to understand this. Thanks for this very informative post. OK:) But the logo? Both looks same… Only Color Difference is there… No legal problems? The WordPress trademark was first registered by Automattic parent company of WordPress.com (remember both WordPress.com and WordPress.org was started by Matt Mullenweg). To keep controversy out, and really make WordPress (open-source), the WordPress foundation was established by Matt. The trademark was then donated to the WordPress foundation. WordPress.com is the only business that is allowed to use WordPress in their domain name. The part about this that confuses me is when you say “WordPress.com is the only business that is allowed to use WordPress in their domain name.” Isn’t WordPress.org using WordPress in the domain name?? The thing about using WordPress.com for me is the community behind it. If you just love to write, and you love to read other blogs, wordpress.com is great because it kind of puts you in connection with other bloggers. Of course, as the post says- you can’t modify the blog and not really monetize it either (at least with ads) and you are only allowed so much drive space for content. But if you just want to write and have other fellow bloggers easily come across your posts, WordPress.com isn’t bad for free. Nope definitely not bad for free. It just depends on what you are using it for, and what are your future goals. As your site grow, you can always move.